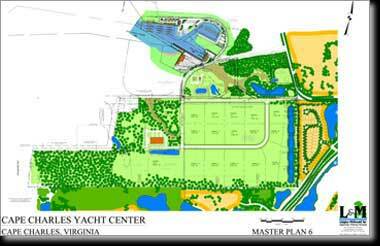 Cape Charles Yacht Center will be the newest full-service megayacht complex on the East Coast. Ideally situated midway between the Northeast states and Florida where the Chesapeake Bay meets the Atlantic Ocean, Cape Charles is the perfect location to provide megayacht repair, yacht manufacturing, and yacht sales in a scenic, natural setting on Virginiaâ€™s Eastern Shore. Ship services will include yacht repair and retrofitting, yacht manufacturing, brokerage, chandlery, storage, fiberglass repair, sailmaking, diesel fuel, and sales centers for several national and international yacht builders. Waterfront permits were secured to construct 3 travelifts: 75 ton, 150 ton and 600 ton capacities, along with dredging and attendant floating docks.